Champion Medalist 31 Series Gun Safe. Electronic Lock, Color is Sandstone Textured, 60-1/2″H x 36″W x 24-1/2″D.,Total Depth, Weight 625 lbs., 39 Gun Capacity. Fire and Security Ratings. 1400 degrees 60 MINUTE FIRE RATING. Phoenix Class II Fire Protection. Tested in an ASME Certified Facility. UL Security Rating. Lifetime Warranty. Boltworks. Four-Way Active Boltworks. Up to 14, 1-1/4″ Diameter Door Bolts. Bolt-Detent System. Roughneck Bolt Guides. High-Security Door. 4-1/2″ Thick Double Plate Steel Door. 11 Gauge Outer Steel, Full 14-Gauge Inner. 1/2″ Reinforced Door Edge. Internal Ball-Bearing Hinges. Two Layers of Fire Insulation. Three-Spoke Handle with Slip Clutch. Body. Up to Two-Inch Thick Composite Walls. 12-Gauge Steel Walls. Up to Three Layers of Fire Insulation. Double-Steel Door Casement. Interior. Plush Velour Interior. High Capacity Gun Racks. Deluxe Door Organizer. 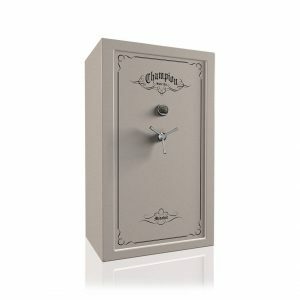 The Medalist Series is our most popular safe and for good reason. It offers excellent security, fire protection, and quality at an attractive price. Features include: 12-gauge American-made steel body, precision four-way active boltworks, and 1400 degrees for 60-minute fire rating. After careful examination, you'll find the Medalist surpasses all other safes in its class. In fact, you'll find it superior to most higher-priced products Built with many features our competitors can't afford to offer thicker steel, the famous Sargent & Greenleaf lock, internal ball-bearing hinges and 100% active door bolts. The Medalist Series gun safe offers excellent security at an affordable price. Triumph 25 Series, E-Lock, Granite, 875 lbs.